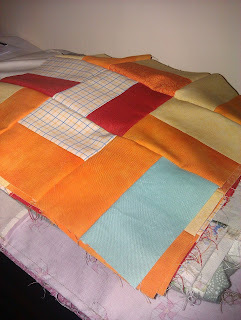 I'm so excited to see this quilt come together! I love the colors and any sewing for boys is exciting! Glad you are starting to feel better, and YAY for helpful husbands! Can't wait to see the rest of this quilt come together! Sometimes husbands can be thoughtful and helpful ;) Still not well here, so no sewing for me too. I always make mistakes when I'm sick and have finally learnt my lesson!